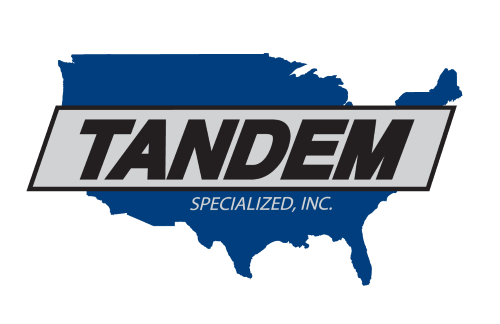 Welcome to Tandem Specialized, Inc.
Tandem is an asset-based flatbed carrier, with headquarters in Northern Michigan. A team you can count on every day. We use new and top of the line equipment to make every move safe and efficient. Our drivers and logistics coordinators work on each and every load constantly, to make sure that freight is moved for our customers within their timeline, to meet production and market demands. Utilizing flatbed trailers (2-axle and up to 8-axle configurations), we offer a wide range of price and service options to our customers. We have flatbed trailers that provide 48' - 56' of deck space, payload capacities of up to 112,000 lb, and everything in between. Our primary service area is the eastern 1/2 of the U.S., with our heavy-haul trailers focusing on services in Michigan, as well as Northern IN and Northern OH with heavy weight permits. Tandem has over 70 years of servicing the transportation industry, and that experience has made the Tandem Team one of the most recognizable flatbed operations in the state of Michigan. With offices currently located in Gaylord and St. Louis Michigan, we are building a new facility in Grayling Michigan to better serve our customers and community. Brick and Stone, Bagged Cement, Dimensional Lumber, Fencing, Fiber Board, Grinding Balls, Gypsum Board, Hardwoods, Machinery & Equipment, Bagged Mulch, Oriented Strand Board (OSB), Particleboard, Plywood, Bagged Salt, Shingles, Steel (plates/bars/coils/rod), Wood Pallets and much more. Don't forget to check out our photo gallery. You won't want to miss a thing. Our corporate headquarters is currently located on Michigan Ave. in St. Louis, Michigan. Accounting, payroll and the majority of our back-office functions are maintained at this location. St. Louis was the original location of the former Tandem Transport, and is a valuable piece of Tandem’s History. Please feel free to contact us for your transportation needs. We are officially in our new facility in Grayling, MI off 4 Mile Rd. Our new location offers us the perfect place to service our customers in Grayling and the rest of Michigan. Maintenance, dispatch, recruiting, and billing all take place at out Grayling location and we look forward to growing with our valued partners. For more information about our new Grayling location please click here. We operate primarily East of the Mississippi River, with the exception of a special emphasis in Eastern Texas and Oklahoma. Our heavy-haul services are focused in the state of Michigan, but also includes service into Northern Indiana and Northern Ohio. Interested in moving freight? Call our sales department directly and speak to one of our team members to get started. Or visit our contact page to send us a message, we will respond quickly and are happy to answer any questions. Tandem Specialized Transportation Flatbed Carrier in Northern Michigan.